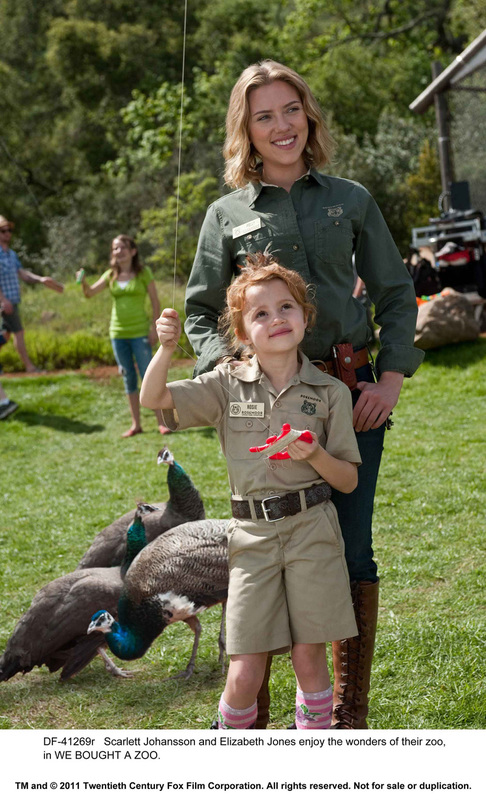 In Cameron Crowe’s inspiring new film,” We Bought A Zoo,” Scarlett Johansson plays Kelly Foster, a plucky and hard working young woman who is dedicated to her job as a zoo keeper and passionate about the animals in her care. Q: What type of woman is Kelly in this movie? A: “Well you don’t go onto a film set knowing that you're going to place 70 snakes in a bucket thinking ‘this is a normal job’ (laughs). We all had to get in there and recapture an escaping shipment of exotic snakes: including pythons and anaconda and other non-venomous snakes. But I was fine because I had reptiles as a child. Now I do have dogs at home – a Chihuahua and a kind of Golden Retriever. A: “I think the story is about challenging yourself and coming out on top through hard work and perseverance. It shows that anything is possible. I know that sounds like a bit of a trite message, but I think there is a lot of truth in it. Q: Although there is bereavement, the film is very positive isn’t it? “We Bought A Zoo” opens January 18 in theaters from 20th Century Fox to be distributed by Warner Bros.